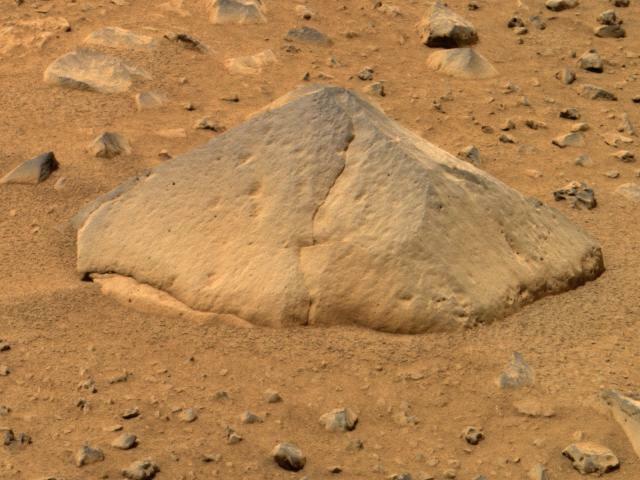 In several parts of Mars, the surface is made of soft and partly compacted sediments. These are usually dust, silt, clay, or volcanic ash — or some combination of these. Being relatively soft, these sediments erode easily under the action of wind-blown sand and dust particles. 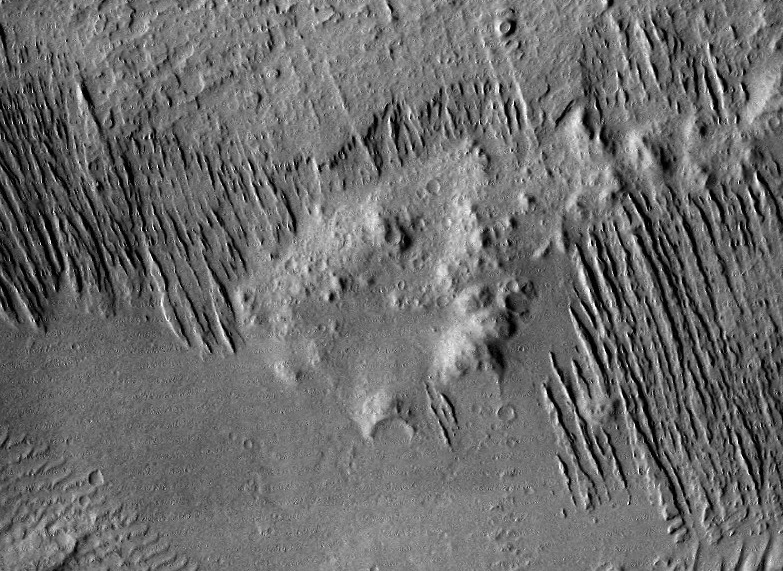 The features that emerge in such a landscape are typically long, linear ridges and grooves running roughly parallel to each other and to the wind's direction. 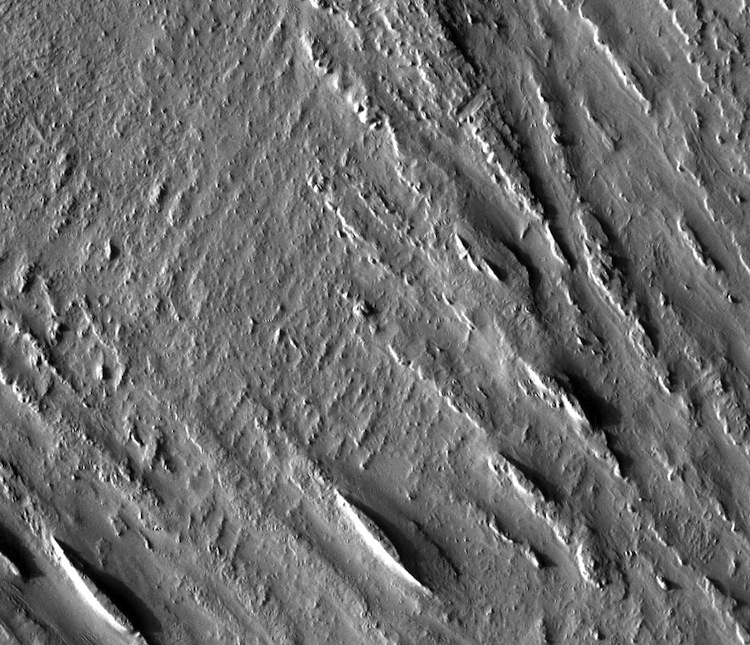 Geologists call these ridges yardangs (after their Turkish name) and they occur on Earth as well as Mars in arid areas where strong winds blowing from a single direction have a chance to attack fine-grain material that's loosely compacted. In some areas, scientists can see yardangs with criss-crossing patterns, suggesting that winds blew from different directions in different earlier eras; each period lasted long enough to place its own "yardang signature" on the sediments. The word "ventifact" comes from Latin and means "wind-made." Scientists apply the term to rocks or outcrops that have been eroded or abraded by the wind. Ventifacts are too small in scale to be seen from orbit. Ventifact formation is a form of wind erosion but on a small scale, so it is seen best by landers and rovers. Ventifacts begin to form as wind throws grains of sand and dust at a rock or outcrop. The impact of the flying grains loosens or chips off microscopic pieces of the rock. Hard, fine-grain rocks such as basalt develop mostly flat sides that scientists call facets. Softer rocks, such as sandstones, soon erode into pits, flutes, and grooves. Multiple facets may develop on a rock due to winds from different directions. Small rocks can be overturned, exposing fresh sides for new facets to form. Scientists can also estimate prevailing wind directions in a region by examining big rocks, boulders, and outcrops, all of which cannot be easily moved or tumbled. Most wind erosion occurs within a meter (yard) or two of the ground because that's where most grains are found for the wind to pick up and carry.